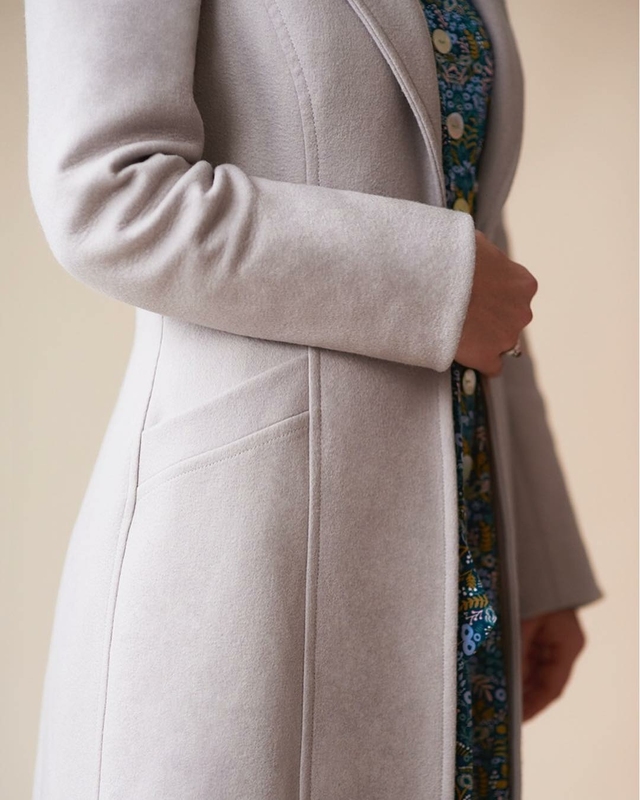 Ever since Elisalex started releasing sneak peeks of the Rumana coat on Instagram, I've been one of the many seamstresses looking forward to its release. 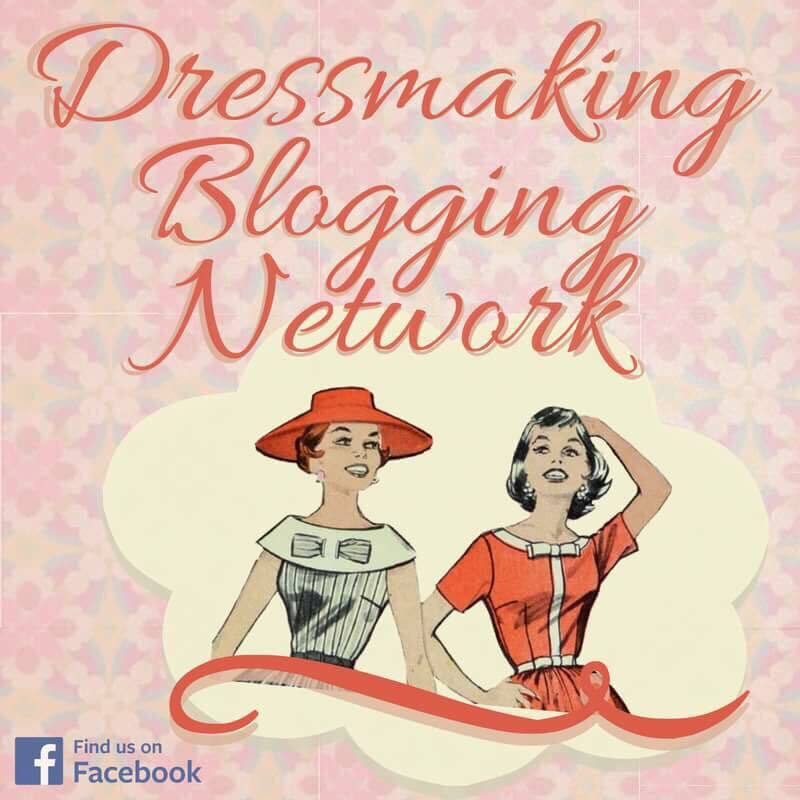 Luckily, it's on the #sewmystyle2018 schedule so everyone signed up to the newsletter could get their hands on a great discount for the pattern. This is not a quick and easy project by any means, but is one of my most satisfying by far. I spent a great deal of time on boxing day looking for fabric that was on sale especially for this project. Having toyed with the idea of a linen spring/summer version, I decided to start looking for a wool. 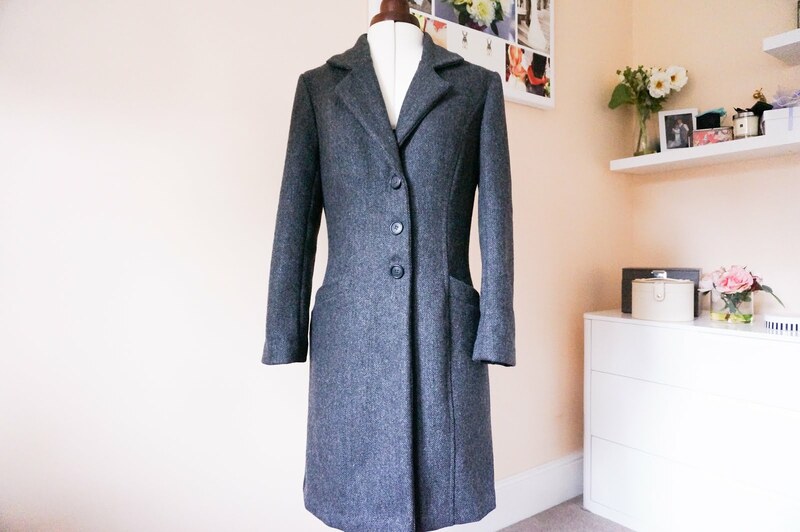 I used a Melton wool for my first coat here, and found it easy to work with as well as warm. 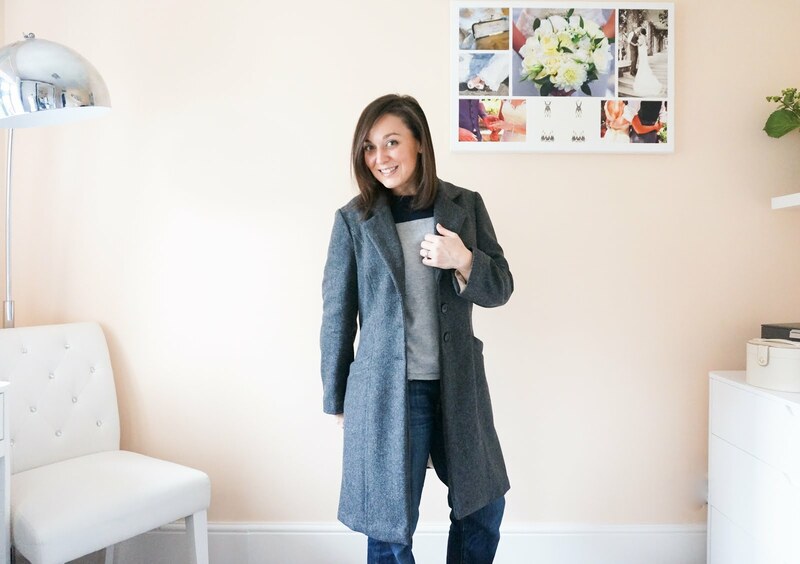 This time around I wanted a charcoal grey to add to my wardrobe, and was also after a herringbone pattern to add some depth. Wool coatings are not cheap to find, and though I generally agree that you get what you pay for, this pattern does need quite a lot (over 3m!) and I needed to find something under £15 per metre. In the end I settled on the Heathcliff herringbone by Fabworks for £10 per metre (yes, £10!). I had been impressed by the fabrics they had on their stall at the GBSB live, and kept them in mind as a go to for wools that don't cost the earth. They have a huge range, so do go and check them out if you are going to make this pattern. I ordered 3m instead of 3.4 because I knew I was going to shorten it...I could have squeezed it out from 2.5 if I had to, but it would have been fiddly. The small herringbone on this fabric has other advantages...you don't have to pattern match as it's so small, plus stitches blend in which means less pressure with the topstitching! I had some left over interfacing from my first coat, so used it for this one (even though it says to use a lightweight interfacing). I did have to buy a little bit more in the end though, so have now used both the black and white versions...you can't notice it at all with this fabric. Click here for purchase link. Applying the interfacing does take a while because it needs to be fused to the front panel and facing pieces. 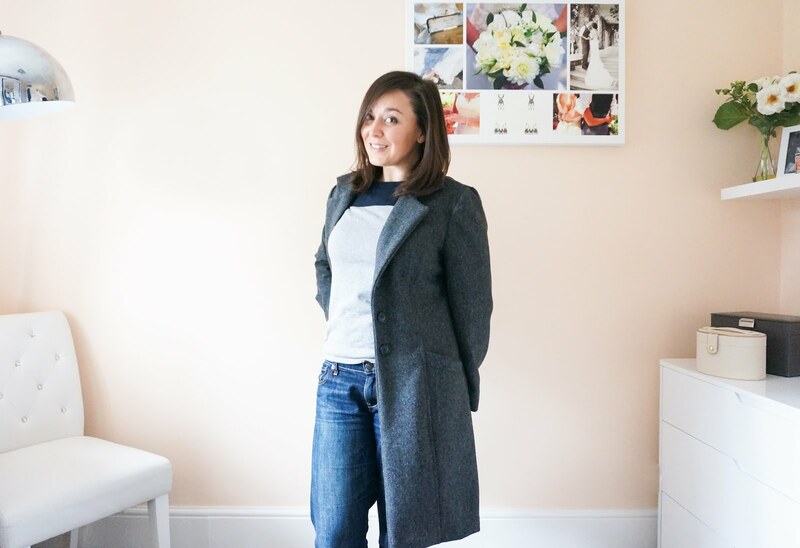 I haven't found it too heavy at all, and am glad of it as the front of a coat gets a fair bit of handling so I know the interfacing is giving it a bit of support too. For the lining I wanted a heavier fabric than I usually use for lining - I can just imagine throwing this coat on and tearing right through the lining! I ended up in my local John Lewis, piling up sale fabrics, including their sapphire satin for my lining. Normally it's £8 per metre; some colours were over half price (not this one in cappuccino though). It's heavier weight than normal lining, but still fluid and slippery. It isn't difficult to work with at all and feels lovely. I also sourced my buttons from John Lewis too. I decided on three quite plain ones, but was sorely tempted by a lot of bling. This is not a pattern for the faint of heart. 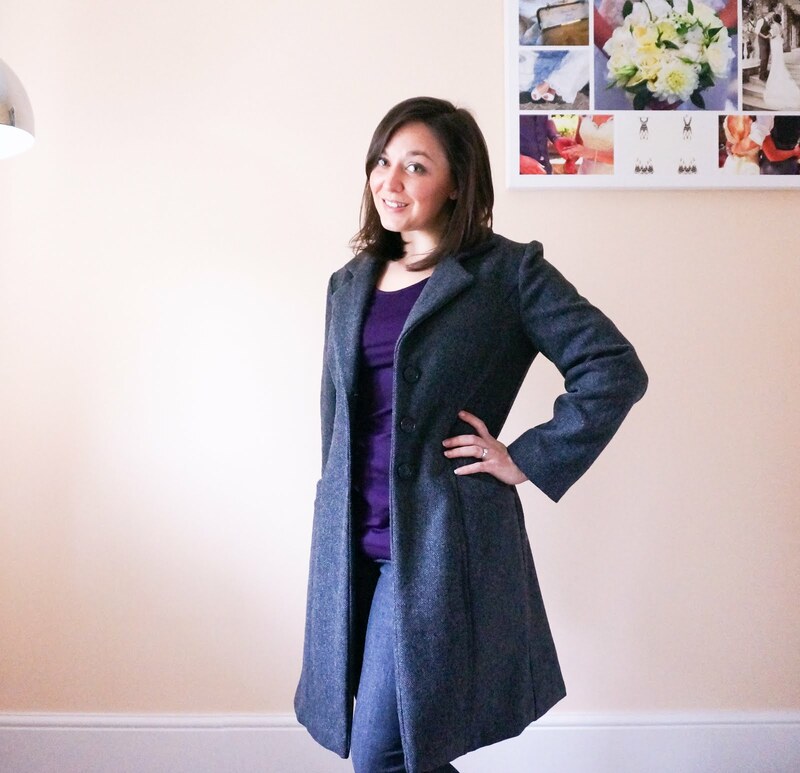 It is a lined princess seamed coat, with collar, two piece sleeves and welt pockets. 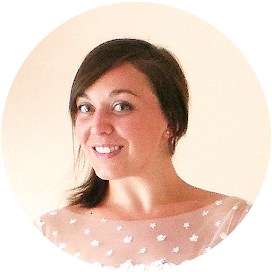 When you purchase the pattern you are able to download copy shop files as well as pdf pages to print. I recommend sending off to the copy shop if you can...it took me over two hours to stick the pdfs together. There are A LOT of pattern pieces that need to be kept track of. You need to pay careful attention to the labels on the pattern pieces. 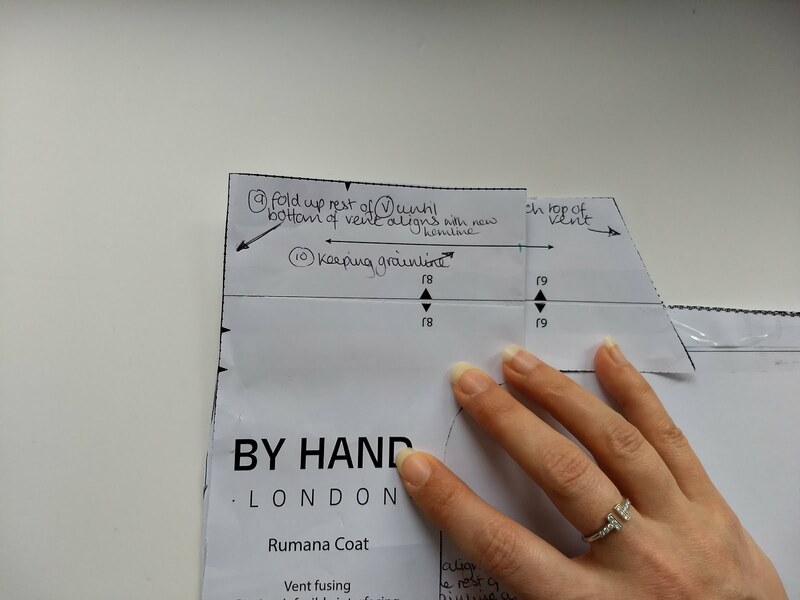 Some of these double up for interfacing too (the layplan diagrams can help you make sure you have everything). The booklet that comes with the pattern also has a lot of helpful information at the front. It is really worth taking the time to read through all of this carefully. Crucially, finished measurements are included at the front. I needed these to calculate my alterations and highly recommend you look at these before cutting out. 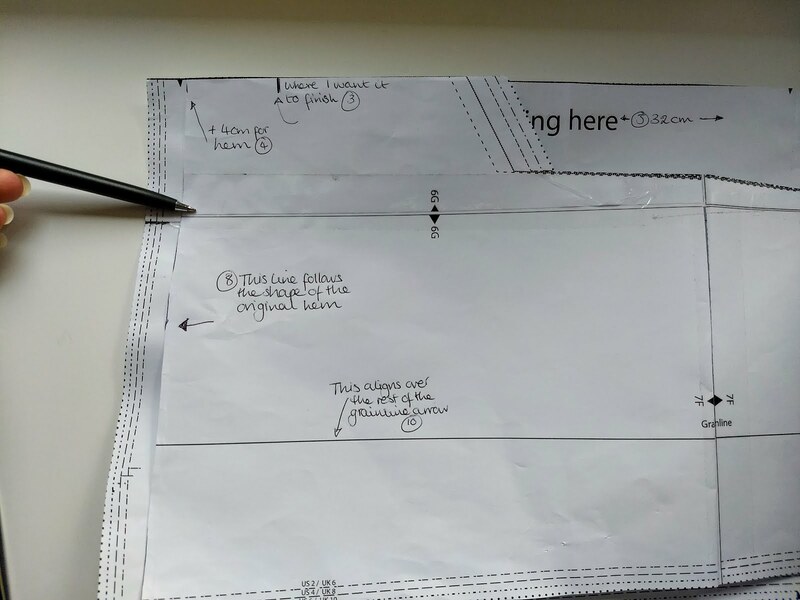 I almost never toile (it is good idea to do one on a pattern like this) and try to work out how the pattern will look using these measurements and the pattern pieces (cut to the size that fits my measurements). 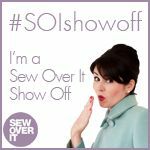 At this stage in my sewing journey, I know that sleeves are often too long, as well as the overall length, so focused on these areas. More on alterations below. Right at the start, when you are attaching the pocket to the upper front side you need to sew the diagonal edge of the pocket to the diagonal bottom of the upper side front, right sides together. 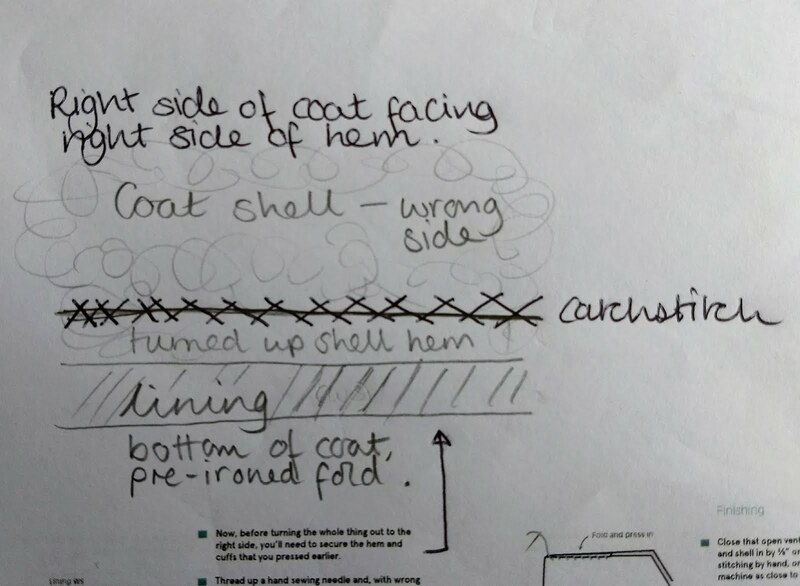 You want the longer side of the pocket towards the centre front, and the shorter pocket side on the edge with the armhole (please excuse my awful notes that I made as I was going through, but hopefully you get the idea). When it came to sewing the lining at the hem, I did a bit of testing first. I did stitch the lining to the sleeves, but then turned the coat through to the right side to check that the lining was indeed aligned with the bottom...if it isn't it is a real pain to redo. It wasn't in my case so I marked where the stitching line would be on the lining, with the help of my dressform. Then I turned the whole thing inside out again and stitched the shell and lining together with a 15mm seam allowance, leaving a gap at the vertical edge of the vent to pull through. 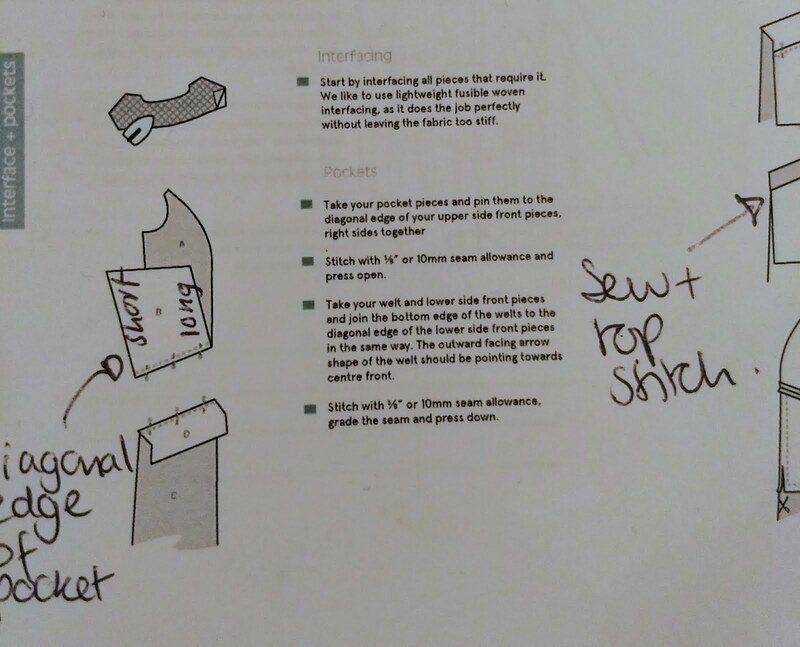 When stitching the hem I found the diagram difficult to understand. My coat was still inside out, and I turned up the hem along the fold I had already pressed (wrong sides facing) and catch stitched it in place. The instructions are written clearly enough here, but the illustration threw me. 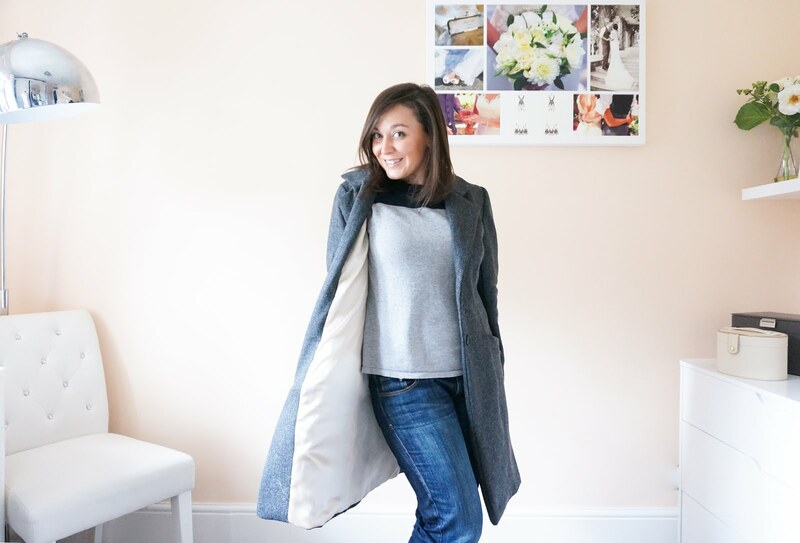 In the end though....have I ended up with an amazing lined princess seamed coat? Yes, and it wasn't fraught with tears, so the instructions and pattern must be quite good to get me to that point! I love the welt pockets, and was so happy that my buttonholes worked well. This took a good couple of weekends to put together, but was a nice project to get stuck into, and didn't feel overwhelming (despite the large number of pattern pieces!) Another bonus....as it's lined the seams don't need finishing (there is a lot of topstitching instead though). It fits really well at the shoulders, sleeves and waist which I'm super happy about. Being 5ft tall, anything below the knee makes me look tiny. This coat is meant to reach quite a low point just above the ankle. I wanted to take this up to knee length, but there aren't any lengthen/shorten lines to do this. I also took up the sleeve length by 4cm, following the same process of pin fitting and comparing with finished measurements. What I like about this make - I love that I've created such an involved and professional looking product. I feel so accomplished! That shows how well drafted the pattern and instructions must be if I can successfully manage this! What I don't like - I wish there was a knee length option, or shorten lines to guide alterations a bit. Also some videos or photos might help for the more complicated parts that took me a while to figure out. Would I recommend this pattern? Yes - I'm very happy with my finished outcome! It is definitely one for when you want to get your teeth stuck into something more involved, and doesn't require any specialist hardware or techniques...just patience.